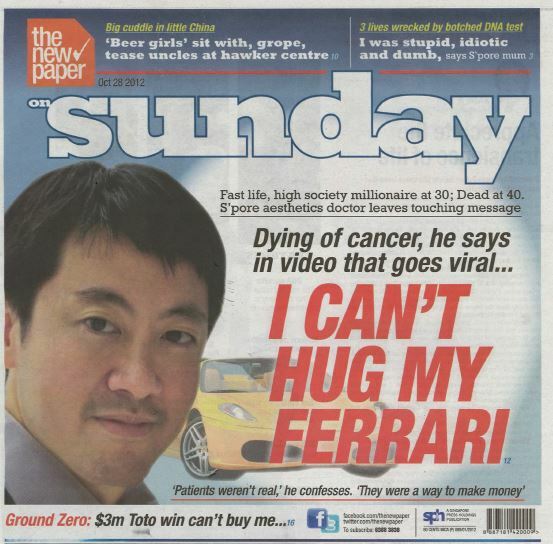 Dr Richard Teo Keng Seng had everything that most Singaporeans could aspire to by the time he was in his 30s — wealth measured in millions of dollars, a thriving aesthetics practice, and sports cars, including a Ferrari 430. Dr Teo’s cars became symbols of his success, but in the end, after he was diagnosed with terminal lung cancer, they meant nothing to him. “Chinese new year… I would drive my Ferrari, show off to my relatives, show off to my friends, do my rounds, and then you thought that was true joy?” reflected Dr Teo during a talk to dental students. It was towards the end of his life that Dr Teo found the meaning of true joy. “What really brought me joy in the last ten months was interaction with people, my loved ones, friends, people who genuinely care about me, they laugh and cry with me, and they are able to identify the pain and suffering I was going through. That brought joy to me, happiness,” he said, in a speech given to an undergraduate medical class before passing away in October 2012. Dr Teo’s speech can be watched in the Youtube link below. Dr Richard Teo’s story was featured in the 28 October 2012 edition of The New Paper. His story serves as a great warning against wholeheartedly pursuing after wordly wealth. Akiane Kramarik (pronounced AH-KEE-AH-NA) is a child art prodigy, who began drawing at the age of four. Born in Illinois on July 9th, 1994, Akiane was raised up in a poor family with three other siblings. She primarily is a self-taught painter. At the age of four, Akiane started sharing her visions of heaven with her parents. Because Akiane was home-schooled and did not watch television, and had never been out of their sight, her parents were certain that no one else could have influenced Akiane’s sudden and detailed descriptions of the spiritual realm. Akiane’s mother was Lithuanian, and had been raised as an atheist in Lithuania; Akiane’s father was raised as a Catholic, but did not share in the family beliefs. Akaine’s family never talked about religion, never prayed togehter, and never went to any church. According to Akiane’s semi-autobiography ‘Akiane: Her Life, Her Art, Her Poetry ‘, about the same time as the visions began, Akiane suddenly began showing an intense interest in drawing. She began sketching hundreds of figures and portraits on whatever surfaces she found at hand, including walls, windows, furniture and books. Akiane seemed unusually patient and serious for one so young, totally immersed in her work. Akiane was not a perfectionist in any other area of her life, though; she could leave her room untidy or her hair uncombed, but her portraits always had to be absolutely perfect. Akiane told Christianity Today that the first time God started speaking to her was when she was three years of age: “He said, ‘You have to do this, and I’ll help you.’ He said, ‘Now you can help people.’ I said, ‘Yes, I will. '” Since that time, Akiane has donated a substantial portion of the money generated from art sales to charity, and when asked why she thinks she received the gift, Akiane said that she believed that she has been blessed by God for one reason and one reason only, and that is to help others. It didn’t seem very long for her to reach her goal, since before she turned 9, Akiane completed her best-known painting, the Prince of Peace, and between the ages of 9 to 12 years, most of Akiane’s drawings seem to have a spiritual theme and a prophetic/visionary quality to them. Akiane’s boost in popularity came when she was featured on The Oprah Winfrey Show at the age of 10, and on CNN, at the age of 12. There is no doubt over Akiane’s artistic talents, but can her claims of having met God be believed? I do not see why not, and note that Matthew 5:8 says: “Blessed are the pure in heart, for they will see God.”; I believe that Akiane’s blessing of seeing God was afforded to her due to her childhood innocence. Akiane’s claim of seeing Jesus Christ is supported by Colton Burpo, the little boy in ‘Heaven is for Real: A Little Boy’s Astounding Story of His Trip to Heaven and Back ‘, who purportedly went to heaven at age three, and who on seeing Akiane’s painting the Prince of Peace, declared it to be the only one (among many others that he had seen) that ever captured what Jesus looks like. Akiane is no longer a prepubescent child, but a lovely 20-years-old young lady, who now resides in Gold Coast, Australia. Has she maintained the same close walk with God, as she did when she was a child, free from all the distractions of growing up? Her art work in recent years seem to suggest that she may have taken a different direction as compared to her prepubescent years. I don’t claim in any way to be an expert in art, but in my eyes, the quality of her recent work remains high (if not higher than when she was a child), and her artistic style seems unchanged, however, I perceive that the inspiration behind her work may have changed somewhat. “I was always interested in Asian culture, and recently my interest focused on Southeast Asia — India, in particular. My dilemma was that there were virtually no Asian Indians in our local area, and if I had worked only from my imagination, it still would not have been enough, because any authentic culture demands a thorough knowledge of traditions and customs. Ironically, a few months later a gentleman from England called my gallery to make an appointment with me. When he arrived to our Idaho gallery we were stunned to see a Hindu Swami from top to bottom dressed in his own traditional robes. His intention was only to share an urgent, confidential and spiritual message, then return back home. But after hearing him, we all convinced him to stay with us longer. During five days of his visit he was teaching us about his culture and faith, eventually agreeing to model for me. This turned out to be a four-month-long painting project, because every detail had to be authentically accurate. Because I sometimes help my pastor to lead worship during funeral services, I get to hear more stories concerning pre-death as compared to the average person. On analysing the stories that I have heard (and from those involving my personal relatives), I surmise that death doesn’t come unexpectedly for most people, and that there are usually a number of signs before an aged loved one breathes his/her final breath. Before they die, many Christians report seeing or even talking to angels (which they may refer to as good-looking people wearing bright white robes). Also, elderly Christians with mild dementia may express to their family members that there are “people” (or a car, or some other form of transport) waiting for them, and request their family members to dress them up, or to groom their hair. On the other hand, at the nursing home where my grandmother was staying, an elderly lady, who was a non-believer and who slept at the bed next to my grandmother, used to complain about (and was fearful of) someone/something that would torment her by poking her with a sharp object from beneath her bed. This elderly woman lucid and not demented or hallucinating — when asked, she could recall many things about her past, including the place she had been living at before staying at the nursing home. In addition, whenever I came to visit my grandmother, I would invariably see her reading the daily newspaper. I eventually bought a bible for her, hoping that it might bring relief from her torment, but later lost contact with her when she was transferred to another nursing home. I had an unmarried uncle who passed away suddenly (of internal bleeding) in his late 50s. He did, however, experience a bout of gastric pain before his passing, but nobody in the family expected that this would be associated with his death, and everyone thought that all he required was some medical attention for the gastric pain. Because my late uncle did not leave a will, nor any instructions on his funeral in the event of his passing, my mum and aunts were left to make that decision for him. They eventually decided that his funeral would be held at one of the funeral parlours in Sin Min. After the funeral, one of my aunts was tasked to sort through his personal belongings, which had been left untouched since the day of his death. My aunt was shocked to find the business card of the funeral parlour in his wallet; the funeral parlour was the very same one that my mum and aunts had chosen for him. Apparently, my late uncle had visited the funeral parlour a few days before his passing, without the knowledge of any family member. There are actually a number of funeral parlours at Sin Min, and it was just too coincidental that my mum and aunts would select the very funeral parlour that my late uncle had visited, in spite of the fact that there never had been any prior family conversations about this. I used to have a male relative whom, whenever I would visit his home in the past, would sit in the living room facing the television set to watch whatever was showing on TV. A few weeks before he passed away, whenever I came to visit him, his face would be glued towards the door (instead of the TV), and he would have this spacey look in his eyes (he was not suffering from dementia before he passed away). His eyes would be fixed towards the door, until he would catch me observing him, and then he would quickly shift his body towards the TV. But shortly after, he would again be staring at the door. I didn’t dare ask him what he was staring at, but I did perceive that his eyes might have been opened to the spiritual realm, because I did notice him a couple of times suddenly shivering for no apparent reason (although the room was not cold), and almost immediately after shivering, he would turn his head elsewhere, as if to avoid something unpleasant (I have the impression that for some people, when their eyes have been opened to other dimension, they are expressedly forbidden not to tell others what they have seen). Months before an elderly female relative of mine unexpectedly passed away, there was a gathering at her house one evening, during which another relative brought a pet dog along. The dog was roaming around the house, when it suddenly barked loudly and ran towards the living room, where everyone had gathered. The dog appeared to be running away from something, and it did so with so much fear, that after colliding into a half-ajar glass door, it still managed to pick itself up immediately, and continue running at full speed towards the living room (where everyone had gathered). Dashing underneath a sofa chair, it whimpered there for some time before coming out. A silence overcame the room until the dog’s owner finally broke the ice by noting that her dog seldom barked, and that she had never seen it so frightened before. I then walked over to the spot where the dog had been standing before it started barking to investigate. I did not see anything that could have triggered the barking (there wasn’t any intruder, rat, lizard, or insect), but had a distinct impression that the year would not pass without incident. One night in October 2010, I had a dream involving 2 coffins. The first coffin that I dreamt of contained a dignified and petite elderly Chinese lady, who was wearing a traditional Chinese dress. This was followed by a second coffin that contained an elderly male relative of mine. The next morning, I read in the newspapers that the mother of Prime Minister Lee Hsien Loong had passed away. I was speechless on reading the news because the physical features of the elderly Chinese lady that I had dreamt of would have matched that of the Prime Minister’s late mother. Although I was disturbed by the dream, I said nothing to anyone because I did not want to draw any rash conclusions. Nonetheless, the elderly male relative of mine unexpectedly passed away 4 months later. Perhaps God was trying to warn me of his impending death. The prosperity gospel is a false teaching that teaches God rewards faith — and hefty tithing — with financial blessings (http://www.christianitytoday.com/ct/topics/p/prosperity-gospel/). Numerous alarmed Christian have pointed out the aberrations of this teaching (please see http://www.huffingtonpost.com/pastor-rick-henderson/osteen-meyer-prosperity-gospel_b_3790384.html , for example), and with time, I also hope to present my objections to the properity gospel in this blog. Nonetheless, I recently came across this interesting article in Charisma News (http://www.charismanews.com/opinion/the-flaming-herald/48828-demon-filled-man-mocks-slaps-powerless-charismatic-pastor ), about a man in Gabia, West Africa, who had been demon possessed since childhood but who had the evil spirit cast out of him, after being prayed for by an evangelist from the U.S..
For 12 years he’d been under the spell of Satan. From a very young age demons unveiled the spirit world to him as degree by degree they possessed him. I asked him many questions and I will not elaborate on the entire interview I had with him, but I want to enforce one main point that was very compelling to me. I asked him if he’d ever sought to be delivered from these demons. He told me that he’d visited many churches, but none could help him. As a matter of fact, instead of being helped the demons in this young man often hurt the amateur exorcists. For example, in the largest charismatic church in the country the demon in this man slapped the pastor and ransacked his office, repeatedly telling him that this church had no power to set him free. “All this church does is talk about money and they don’t live holy,” the demon said. Can you believe a demon said that? Demons know churches. Demons know men. “Jesus I know, Paul I know, but who are you?” (Acts 19:15). Beware of prosperity teachers! These teachers do not preach out of sincerity, but rather, it’s really your money they are after (2 Corinthians 2:17), and “in their greed they will make up clever lies to get hold of your money” (2 Peter 2:3, NLT).